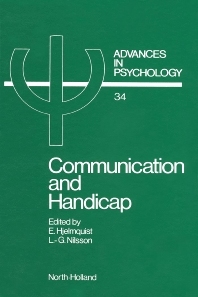 Communication, Compensation and Handicap (L.-G. Nilsson). 1. Hearing Aspects of Handicaps. Compensatory Strategies in Speechreading (J. Rönnberg and B. Lyxell). Compensatory Use of Acoustic Speech Cues and Language Structure by Hearing-Impaired Listeners (D. House). 2. Visual Aspects of Handicaps. IT Make Sense: Form, Content and Use of Information (S. Aitken). Compensation as Skill (K. Ohlsson). Travelling without Vision: On the Possibilities of Cognitive and Perceptual Compensation (G. Jansson). Computerized Presentation of Text for the Visually Handicapped (N.L. Williamson, P. Muter and R.S. Kruk). Blind People Reading a Daily Radio Distributed Newspaper: Braille and Speech Synthesis (B.-M. Drottz and E. Hjelmquist). 3. Reading Deficits. Working Memory, Reading and Dyslexia (A. Baddeley). The Reading/Short-Term Memory Relationship: Implications of an Exception (R.L. Cohen). Compensation in Reading Disabilities (I. Lundberg and C.K. Leong). 4. Neurological Aspects of Handicaps. Aphasia Therapy Research: Methodological Requirements and Illustrative Results (S. Byng and M. Coltheart). Possibilities of Spontaneous Compensation for Aphasic Symptoms in Conversation (E. Ahlsén). Blissymbolics, Cognition and the Handicapped (P. Muter). Lexical Prediction for a Text-to-Speech System (S. Hunnicutt). Conclusion: Communication and Handicap (E. Hjelmquist). Theory and data on various aspects of cognition, communication and handicap are presented here, related to two sorts of psychological compensation. On the one hand, basic principles of cognition are employed with the purpose of helping to overcome communicative difficulties among handicapped people, and on the other, various sorts of technical aids used for compensatory purposes are examined. Many of the papers presented here stem from a conference held in Stockholm in 1985, sponsored by the Swedish Council for the Planning and Coordination of Research, as part of a large-scale project on handicaps. Although researchers in psychology were in the majority, students of other disciplines also took part.